This is not one of the official Nissan Juke-R's, but it looks like it works. The fender flare, and tire package leaves a little to be desired, but to each their own. In the video, we get to see the car?suv?crossover thing attacking Nurburgring. Sounds decent, and looks like it goes fairly well too. 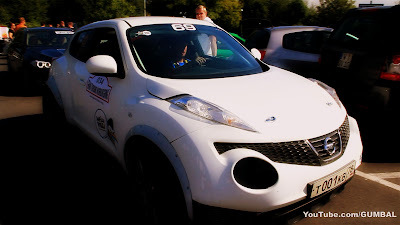 During the GranTurismo Events on the Nurburgring, I recorded this Nissan Juke-R with R35 GT-R engine. It's not the official Juke-R, but a personal project by Shpilli Villi Engineering. The Russian-based company called Shpilli Villi engineering went creative in turning this crossover into a special one-off that could not be found elsewhere. By putting it under the knife for a heart transplant, they took off the original 1.6-liter to make way for the tuned GT-R engine strapped with HKS turbos that has an output of 700+ horsepower. It is said that if fed with 109 Octane gas, they could get this Juke-R running on 800-horsepower! The results are astonishing! Thanks you for watching my videos and supporting my channel. All feedback on my videos are appriciated! Don't forget to like the video and subscribe to my channel. More videos coming up!